What will the digital world look like, in 2018? Join us as we discover the major web and tech trends, and how they will shape the way we design. “The times they are a-changin’”, said a certain Nobel Prize winner in Literature. Well, they are indeed a-changin’, and it’s happening faster than most of us expected. Never before has technology spread so rapidly as it did over the past years, and 2018 promises to be even more exciting. These developments, from virtual reality to sound activated devices, have a wide influence on our society as a whole. More importantly for us, they directly impact the world and language of design. Knowing the fabric of the future in advance can be tricky. But since curiosity is our middle-name, we couldn’t resist the temptation to inquire further. To understand better what will happen this year, we’ve teamed up with forecasting agency The Visionary for some quality insider’s trend deciphering. We’ve also interviewed dozens of professional designers from various disciplines, as well as coders and tech specialists. The result? A fascinating exploration into the tech, web and design trends to watch in 2018. Information is everywhere, and when you look at your three-year-old nephew browsing YouTube like a champ, there’s no doubt that the human species has adapted to that evolution very well. The question is no more “How many ‘bytes’ can one digest?”, but rather “What kind of data do we want to receive?” From the fake news scandals to Facebook fighting clickbaits, Internet users have become increasingly aware that not every content is equal in worth. We can connect this trend to another phenomenon: the growing demand, from customers, to know more details about what they purchase. Companies are asked to be transparent, public exposing where the goods were produced, by whom, how, and ultimately, the level of ethicality involved. It’s now customary to see this information displayed on the actual packaging, but we expect to see more brands opting for social media, or even dedicating parts of their websites, to present these “behind-the-scene” facts. This is how sustainability and fair trade are becoming, slowly but surely, central parts of online marketing campaigns. With these types of data (and more) in demand, we will be asked to find new ways of displaying content in an organized, aesthetic and accessible way. Infographics have developed over the past years, but we expect to see more dynamic and interactive interfaces in the near future. For example, look at how this clothing brand transformed a Google Maps widget into an informational hub to disclose their ecological footprint. Do these developments require us hiring an armada of coders to back our design efforts? Not necessarily, as technology breakthroughs, such as hassle-free coding systems, already enable the creation of sophisticated pages in an intuitive way. To all those people who think designers are narcissistic: think twice! On top of initiating trends and creating crispy visuals, more and more influencers are addressing issues it would be easier to ignore – such as women’s rights, inequality, or climate change. The good thing is that, when these subjects are raised by inspirational figures like Vivienne Westwood, the likelihoods are that the public will listen. It’s worth browsing her Climate Revolution website, to see how a mere blog can be used as an effective tool to change perceptions and spread (bold) messages. Another example is given by fashion designer Stella McCartney who partnered with the organization Parley for the Oceans to create luxury high-fashion, made using ocean plastic waste. Of course, not all of us have the same influence as V. Westwood and S. McCartney. But we all want to make an impact, even a modest one. Some design schools around the globe already teach their students to be responsible with the quantity and source of the materials they use. Designers have another significant card to play, by creating tools for people to raise awareness of world issues. Social media is still the most natural choice, because of its (zero) cost, agility, and potential for spreading content in different communities. But more sophisticated channels are in demand, enabling users to achieve multiple goals at once, such as sharing background information on products, accessing ecological databases, starting crowdfunding campaigns, and more. We might even see the creation of ‘activist’ apps, enabling customers to rank companies according to their level of sustainability – making it as easy as liking a Facebook post. From the prehistoric tools used to create figurines to Andy Warhol’s silkscreens, technology and art have always gone hand in hand. The integration has gone one step further, with the Internet becoming an actual medium for contemporary artists’ work – as opposed to just offering a way to promote themselves online. We’ve already seen Alexandra Gorczynski creating websites as pieces of art, sold like any other physical creation. The use of social media is another fresh perspective that blurs the boundaries between “high” and “low” culture. For their event In Search of Us at the MoMA, Petra Collins and Madelyne Beckles worked with Instagram to post a live three-hour scene, transforming the museum’s lobby into a “digital salon”. The trend is not the prerogative of young and wild creators. Established artist Cindy Sherman created a buzz when she first used the ‘gram to exhibit her series of contorted selfies, and Christie’s and Sotheby’s curators are now browsing the social platform to discover new names. thank you endlessly for everyone who came out and supported last night. Still beaming🔥love all the ladies who created this piece with @bellhoox and I!! Set @laurennikrooz costume @zaraeloise florals @brrch_floral ceramics @0h_heck and @kevinhayden for killing it with the lighting. @junglepussy who MURDERED her set and our three beautiful performers @monicagh_ @yiauekitalki @samiralfarius love you allll!!!! Also if anyone has photos from last night please send to me!!! 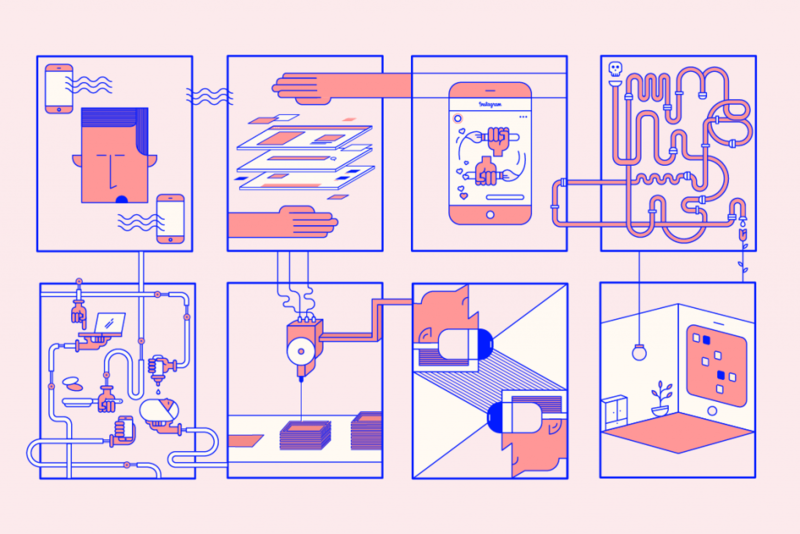 With a bigger part of the creative community being inspired by the web, designers can examine ways of collaborating with artists, offering their visual and technical expertise. It’s a two-way process. In return, we can expect designers to be influenced by the way in which artists perceive the Internet. Even more diversity is expected to take over web design in 2018, with exotic fonts, chaotic color combinations, contrasted images and more. Expressive trends, such as brutalism, will continue to flourish, giving us the legitimacy to do what we want – and not necessarily what we “should”. Chat apps have become an integral part of our lives. (It’s sometimes hard to imagine how we survived that long without the facepalm emoji…) Although apps are constantly upgraded with more options, researchers have found that they don’t make the cut anymore. Even live videos and GIFs don’t seem as enchanting as they did two years ago. Our needs have simply increased faster than technology. A revolution needs to arise – and it looks like it’s coming in the form of incorporating pre-recorded voice messages, music or even random sound samples as a way of communicating. Different routes are currently being explored to make the most out of it, some of them very promising – like these sound encoded tattoos that you can listen to on your smartphone. As well as our eyes, it’s our ears that we’ll have to keep open in 2018. As designers (and more precisely, the UX experts among us), we’ll start exploring sound-based interfaces. A lot of cool features can be developed, whether it’s a bank of personalized sound samples similar to choosing a sticker, or more advanced recording tools. This latter category will require a completely new visual language, seeing as the well-known ‘microphone’ icon is already a thing of the past. And don’t expect to put your feet up any time soon, as more and more interfaces are shifting to be sound activated, from smart home devices to Google’s very own search bar. With virtual reality (VR) technology developing rapidly, its aesthetics are popping up in other places. The visual language of 3D virtual worlds is already influencing designers from various practices – including web design. What’s on the menu? A lack of gravity, random objects appearing to float in space, and almost no relation to proportions and perspective. This futuristic look contrasts with older (but still widespread) languages, such as references to the world of vintage games. Combining them can be risky, but when finely executed (like Ignasi Monreal‘s work for Gucci), the assemblage provides an exquisite, surreal and highly digitized sensation. More companies are expected to use VR on their websites to complete their branding, giving designers an opportunity to create virtual worlds online and simulate various experiences. In 2018, we’ll discover new interactive online shows, in which the viewer enters an alternative world and can narrate the story, choosing each character’s actions, similar to a video game. This type of interaction will add a new sector for designers to create imaginary and dynamic worlds. Some disciplines might be affected slower than others, but now is definitely the time to sharpen our skills – acquiring the mastery of digital tools, and learning how to work in 3D environments to create 360° scenes functioning seamlessly. Discover more through link in bio. Everything has now become much more accessible, thanks to our smartphones, that require just a few lazy thumb movements. As a result, 2018 should see an increasing number of activities that people will prefer doing from home – including purchasing goods, working, or even dating. This deep social trend will impact our daily lives in more than one way. Communication tools will be upgraded (see chapter 4 of this article), possibilities of “leaving the house” through AR vacations will emerge, and shopping experiences will resemble video games. Still not Blade Runner, but really not far from it. Reservations, now open. The #FutureofHousing is here. As communication is crucial for people working remotely, we’ll see multiple-user chat apps (such as Google Hangouts or Skype) continuing to improve. An increasing number of companies are functioning via the digital space, enabling employees to work from wherever they desire. This will open up an opportunity for designers to create platforms that match the new needs, and make remote work simple and comfortable. We’ll also be drafted to design cutting-edge project management tools for dispatched workers. For example, the “screen sharing” feature should keep on developing, allowing users to share even physical objects, such as post-it notes or diagrams, with the help of augmented reality. 3D printers have made their mark in our daily routine, creating specific habits in users – and maybe even a mentality. Did someone say “lazy”? Downloading a file, sending it to the printer, and instantly receiving a finished product, is something that we want to see applied in other fields. You can already see the impact of this mindset in multiple fields, like websites allowing users to customize their own jewelry or furniture, get them printed and receive them by post. In 2018, this phenomenon will go to the next level. The ‘3D Printer’ – or ‘instant’ – mentality will keep on invading more grounds, like video creation (with algorithms that can automatically transform any article into a short movie), or artificial intelligence creating instant websites. Some are already thinking of crazier applications, such as transforming a drawing into a piece of music. Nothing will ever replace the work of a flesh-and-bones creator. But we, as designers, need to consider how to use these developments to our benefit (like creating a web page’s first draft with artificial assistance, saving enormous time), rather than being the victims of them. Over the last years, China has invested considerably in technological advances. This is not stopping any time soon. In fact, Chinese developments could be seen as the future of the Internet, taking virality to the next level. Think of WeChat, the ‘super-app’ that offers endless services at once, from the standard message sending, to booking a doctor’s appointment, to ordering a meal at a restaurant. It also enabled its users to send an electronic red envelope on Chinese New Year, which proved to be very popular and boosted the dissemination of the app. This extreme networking technology is a game-changer and is already influencing the West, with more apps aiming to imitate it. Nowadays, people expect to do everything on a website, from browsing galleries, to buying products, to booking appointments and chatting in real-time. We believe that this phenomenon will continue to expand. Designers need to adapt and find new ways to improve these all-inclusive apps (and websites). Solving complexity is one of the main topics here, as users need to easily find the right functionality in content rich environments. Strategic thinking is also a key element: the creators of these apps will have to understand which features are the most important – and which can be sacrificed for the sake of usability. Finally, each feature of the app needs to be better than the individual app that already exists, and that has had years to improve itself with experience.